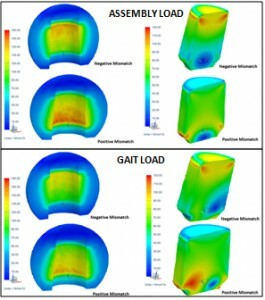 We routinely use Finite Element Analysis (FEA) to simulate experimental conditions in our investigation of the musculoskeletal systems and of implant devices. We continue to expand the scope within which FEA can be implemented and have adopted this method to answer questions pertaining sports injuries, joint mechanics, and implant corrosion. Internal stress in the femoral head and trunnion under different conditions of simulated loading. Through the use of computer models, we can determine the effect of design factors (e.g. angular mismatch) on the interface stress and motion under simulated conditions of assembly and gait. Patient-specific knee and hip joints reconstructed from high resolution MRI data sets are used to study joint mechanics and soft tissue response under simulated conditions of loading. Once validated, these models are used to investigate various simulation conditions. 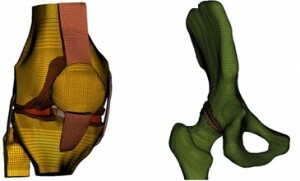 Finite Element Models of the knee joint and the hip joint.